Bette Corsan is a Shamanic Iboga Healer, who was initiated into the Missoko Bwiti in Gabon in 2015, and completed her Rites of Passage in that same year. She studied with a generational African Shaman on the specific uses of the medicine in a Western context. Previous to that, she was a research archivist and professional artist for 8 years. With the knowledge that she learned assisting the shaman, combined with an intuitive approach to art, Bette developed a modality of Iboga Art Therapy. 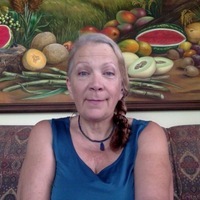 After attending a GITA workshop in Vancouver, she began to combine the shamanic work with the GITA medical protocols and to work with a Naturopathic Doctor in Costa Rica. She has also worked briefly with Trevor Millar at Liberty Root in Vancouver, Canada, and more extensively with Mark and Robyn Howard at Iboga Soul in Squamish, B.C. At present, she is located in Malta, Malta and is in the process of opening a wellness centre there, called Living Life Malta Shamanic Healing Centre. She is excited to have the opportunity to work with doctors there, in providing hospital treatments, as well as other shamanic healing opportunities. She continues her training in Africa and looks forward to helping to bring the benefits of the traditional knowledge to the forefront of Ibogaine Treatments.